I only needed to contact them once and they were very helpful and nice. I liked that I didn't need a lot of contact as I could get in the house with a key code but I knew you were there if I needed you. The property was very nice. I LOVED the view and beach access. The porch was the best where we could sit in the shade and watch the waves roll in! I've had a great experience staying with A1 Property Management twice now, and I plan to come back for years to come! We enjoyed that it was on the beach, obviously, but it also had a personal touch. There were books, DVDs, and puzzles and games in a closet that my children could enjoy, plus umbrellas and things like that available for us. We had a great experience dealing with the team at A1 properties. This is our second year booking with them and Id definitely rent from them again. The property was clean, updated and just as they described in the listing. Very prompt with answers to questions or concerns. Very well furnished house. Very comfortable beds. Short walk to the beach. Cannot say enough about A1. Always available, going above and beyond to accommodate. As always, you forget to bring something on vacation. Rather than paying beach prices, why not use Amazon! Unfortunately, Amazon could not deliver to the condo but A1 stepped in and allowed us to ship to their office. A1 delivered the items to the condo, so we would not miss beach time!!!! Great vacation, we will be back. Our stay at Kelleys Kastle/Ocean Dunes in Kure Beach managed by A1 Property Management was fantastic. Our first stay at Kure Beach will not be our last. The condo was bright and clean with all the amenities needed for a great vacation. Location was superb, elevator and stair access within feet. Allowing for coffee and margaritas on the deck overlooking the ocean, and toes in the sand within minutes. Parking was easy and very accommodating. The process was seamless and easy. Very helpful since this was our first visit to Kure Beach. Two families rented this condo for one week. With 13people in the house (9 kids), we never once felt on top of each other and never once heard the people next to us. This condo is spacious, and absolutely gorgeous. The only negative would be he deck space. We tend to spend a lot of time on the deck st the beach in the evening, but it isnt a possibility here at this property. We solved this by spending time at the beach a few evenings during he week. This is a fabulous property, and the owner should be very proud ! David and his family were so nice to work with. They were always quick to answer any questions we had and kept us updated via emails. The property we rented, Breath of Heaven, was absolutely perfect for our family of 10. It was just across the street from the ocean, with an ocean view, had a large open living area and kitchen and a nice little yard outside for the children. We would definitely rent again. Loved it! Quick responses to emails. I loved the location and amenities. This was our 1st condo experience and it was a joy! Very helpful. Check in was easy! The house was beautiful. It was clean, spacious and well maintained.Good location. Very positive experience. Appreciate being able to get into condo a little early when I arrived and it was cleaned. The view!!! 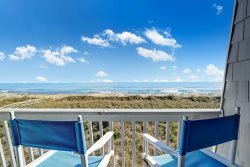 We love Ocean Dunes and this unit is very nicely updated. I liked that the property was what was shown in the pictures....no surprises! David and his family are always a JOY to work with and talk to. I met David for the first time this trip and he was super helpful and friendly and came right over to help. We absolutely LOVE everything about the property. The furnishings, location, its just an amazing place and we love it so much! The team was great in helping us. The condo was nice and clean, well equipped with nice beds ! Location, location, location !!! I have been renting houses for close to 20 years, I have never been so close to the beach ! It was nice, especially in light of the weather -when the sun came out it was nice and quick to run out to the beach !!! Excellent, called 2 times with questions and both times got a person who answered the questions successfully. So nice that it wasn't just a recording on the other end! Clean, private bathroom for each bedroom. Very satisfied especially with David. He is very conscientious.